Counterfeiters are increasingly pushing fake notes of higher denominations into the market, with a 54% rise in detection of fake Rs 1,000 notes in the banking sector, the Reserve Bank of India (RBI) has said. 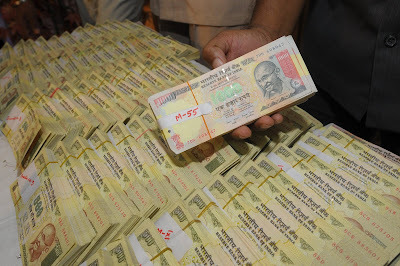 The total value of fake currency seized by banks in 2011-12 amounted to Rs 24.7 crore. In an RTI reply, the RBI said the number of counterfeit notes detected by banks increased to 5.21 lakh pieces in 2011-12 from 4.35 lakh the previous year, an increase of approximately 20%. The data shows that maximum counterfeit notes were detected in the Rs 500 denomination followed by Rs 100 notes. As per the RBI reply, there was 23% increase in the detection of fake Rs 500 notes. These fake notes exclude the counterfeit currency seized by security forces and other government agencies. Sources said the quantum of counterfeit currency outside the banking system would be much higher. The information supplied by the RBI also shows that there was a major dip in detection of fake currency between 2004-05 and 2006-07. After this period, there was major increase in banks detecting fake notes. The trend indicates that circulation of fake notes in the Rs 10, Rs 20 and Rs 50 denominations has been coming down. RBI records show that the counterfeiters have shifted focus from Rs 100 notes to Rs 500 and Rs 1,000 ones. There has been continuous decline in detection of Rs 100 counterfeit notes. While 1.42 lakh such notes were detected in 2009-10, the number decreased to 1.24 lakh and 1.23 lakh in the next two fiscals. In reply to activist Subhash Agrawal's query on the average life of notes of each denomination, RBI said, "No study has been done so far in this regard. However, conventional wisdom indicates that small denomination banknotes have a lower average life than banknotes in higher denominations - Rs 100, 500, 1,000."